The Denver Broncos had a 5-1 record as they met the Seattle Seahawks on October 22, 1989. In their ninth season under Head Coach Dan Reeves, the key to the offense remained QB John Elway (pictured at right), and rookie RB Bobby Humphrey was giving a lift to the ground game. However, it was the revamped defense that was most responsible for the club’s success in the early going. Seattle was 3-3 and coming off a narrow win the previous week. 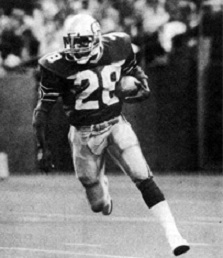 Under Head Coach Chuck Knox, the Seahawks had operated with a conservative, ground-oriented offense, and that was still the case with RB Curt Warner and FB John L. Williams. QB Dave Krieg was capable, and while WR Steve Largent was in the twilight of his great career, WR Brian Blades was emerging as a star in his second year. There were 62,353 fans in attendance at the Kingdome. The Broncos started off with a short series and punted. The Seahawks, taking possession at their 35, drove 65 yards in 11 plays. A key play came in converting a fourth-and-one situation at the Denver 45 as Curt Warner took off for a 21-yard gain. Facing third-and-four at the 18, Dave Krieg scrambled and threw to WR Paul Skansi for 17 yards. A run by Warner lost yardage, but John L. Williams ran around left end for a four-yard touchdown. Norm Johnson added the extra point to give the home team a 7-0 advantage. The teams exchanged punts and a 21-yard kick by Mike Horan of the Broncos gave the Seahawks the ball at the Denver 43. Seattle was unable to take advantage, however, as Warner fumbled two plays later and SS Dennis Smith recovered for the Broncos. The Seahawks had possession at the end of the opening period and drove 55 yards in eight plays. Krieg completed a pass to Warner for 24 yards and followed up with a toss to Brian Blades for 15 yards to the Denver five. Three plays later, Krieg connected with Williams for a five-yard TD. Johnson again converted and Seattle had a 14-0 lead. The Broncos had to punt following their next series and Seattle drove into Denver territory. Warner (pictured below) and Williams ran effectively and Krieg passed to WR Louis Clark for 20 yards. The drive stalled at the Denver 18 and the Seahawks came up empty when Johnson’s 36-yard field goal attempt had to be aborted due to a bad snap that hit the holder, QB Jeff Kemp. That was the closest that either team came to scoring during the remainder of the first half and the score remained unchanged heading into the third quarter. Denver had managed just three first downs and 13 rushing yards in the first 30 minutes. The Seahawks had the first series of the second half and punted. The Broncos put together a drive that was helped along by a 43-yard pass play from John Elway to WR Michael Young that was originally ruled out of bounds but was overturned upon replay review. However, the Broncos also failed to score when, after a short running play, Elway threw an incomplete pass and then was sacked by NT Joe Nash. David Treadwell attempted a 46-yard field goal that sailed wide to the left. Denver got the ball back three plays later when a Krieg pass was intercepted by CB Tyrone Braxton, who returned it 19 yards to the Seattle 27. Elway threw to WR Mark Jackson for 13 yards and Bobby Humphrey took a pitchout and ran for 12. Facing second-and-goal from the one, and with the home crowd creating a deafening roar, two runs into the line were stopped but, facing fourth down, Humphrey ran into the end zone for a touchdown. Treadwell added the extra point and Seattle’s lead was trimmed to 14-7. As the game headed into the fourth quarter, and following a punt by the Seahawks, Elway promptly threw long to Jackson for a gain of 49 yards to the Seattle 10. Three plays later, and scrambling away from defenders, Elway connected with TE Clarence Kay for a two-yard TD and, with Treadwell’s kick, the game was tied at 14-14. Williams fumbled for Seattle on the next series and Dennis Smith recovered for Denver at the Seahawks’ 40. The Broncos weren’t able to advance more than seven yards and punted. Seattle had to punt in turn but Elway fumbled the snap on first down and LB Darren Comeaux recovered for the Seahawks at the Denver 35. Three plays later, Krieg threw to Skansi for a 24-yard touchdown and, with Johnson’s extra point, the home team was back in front by 21-14. Regaining possession with 5:22 to play in regulation, the Broncos went three-and-out on their next series and punted. The Seahawks were unable to maintain possession and punted it back. With the clock now down to 2:31, Elway rolled to his left and fired a long pass to WR Vance Johnson that went the distance for a 54-yard TD. Treadwell again converted to tie the score once again at 21-21. It looked as though the Broncos would pull the game out in regulation when, after getting the ball back following a punt by the Seahawks, Elway threw to WR Michael Young for a 47-yard gain to the Seattle nine. But Treadwell was wide on a 27-yard field goal attempt with 19 seconds remaining and the game went into overtime. Seattle had the ball first and converted two third downs on the way to reaching the Denver 22, but Johnson’s 40-yard field goal try sailed to the left and was unsuccessful. The Broncos had to punt following their series but Krieg’s first down pass was intercepted by Smith and returned 28 yards to the Seattle 10. Treadwell immediately took the field and kicked a 27-yard field goal to give Denver a 24-21 win with 7:14 left in the extra period. The Broncos had the edge in total yards (371 to 363) although Seattle had more first downs (23 to 15) and dominated time of possession (40:21 to 27:25). The Seahawks also recorded four sacks, to two for Denver. But Seattle turned the ball over four times, to one suffered by the Broncos, although Denver was hurt by 13 penalties, at a cost of 84 yards, to four flags thrown on the Seahawks. Both teams suffered failures on special teams that could have made the difference in the outcome, with David Treadwell missing three of four field goal attempts and Norm Johnson failing on one and having another aborted due to a bad snap. 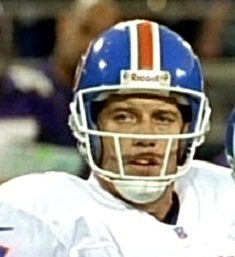 John Elway completed 18 of 35 passes for 344 yards and two touchdowns with none intercepted. Mike Young had 6 catches for 137 yards while Mark Jackson and Vance Johnson contributed three apiece, for 74 and 67 yards, respectively, and Johnson scored a TD. The running game was kept in check as Bobby Humphrey gained just 50 yards on 17 carries that included a score. 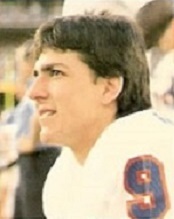 For the Seahawks, Dave Krieg was successful on 22 of 38 throws for 237 yards and two TDs, but with two interceptions. Curt Warner (pictured at left) ran for 74 yards on 22 attempts and John L. Williams contributed 62 yards on 18 carries with one touchdown while also catching five passes for 28 yards and another score. Brian Blades had 6 pass receptions for 61 yards and Paul Skansi gained 81 yards on five catches that included a score. The win put Denver three games in the lead in the AFC West and the Broncos remained on top as they coasted to an 11-5 record. They won the AFC Championship before being humiliated by the 49ers in the Super Bowl. The Seahawks won their next game but then dropped four straight on the way to a 7-9 tally and fourth place in the division. It was Seattle’s first losing record in seven seasons under Coach Knox. Things got better for Treadwell, the first-year placekicker who had hit on 12 of 13 field goal attempts coming into the game at Seattle, as he ended up missing only six field goals all year. He connected on 27 of 33 attempts and was chosen to the Pro Bowl. The 27 field goals led the AFC , as did his 120 points.